Seattle's King County Metro system provides the backbone for students to discover stories in different neighborhoods. A colleague and I often laugh that students say, “I don’t have a story,” when we walk across campus and see at least 10 stories in a few days. As educators, how do we help these young journalists develop a sense of wonder and curiosity about the world around them? It is truly a matter of practice. This exercise will get them out of their bubbles and into the field. Years ago in ecology class, our teacher took some string and charted out one-meter squares on a huge field. He then said, “Find and note every type of living thing in your square.” We had fun and realized there can be so much flora and fauna in just a little bit of space. To do this for our journalism students, we substituted a bus route for that meter-square of grass. Each student would get a route assignment plus the challenge to find stories surrounding it. I’m a fan of the Seattle Metro system and spent quite awhile on maps in search of routes that would get my students into the more diverse parts of the city. The exercise attempts to get students thinking about the types of stories they would tell, so each student produced one text story, one audio story, one photo essay, one video story, and one infographic. This gives each group 25 stories to choose from in the end and each has to stretch to do something challenging. While it works well for multimedia, the same thing could be done for any one of these skills at a time. The blue line is the Metro bus route and the pink lines are the borders of the find-a-story assignment. The students all had their own WordPress sites, so material could be posted there as stories were finished. 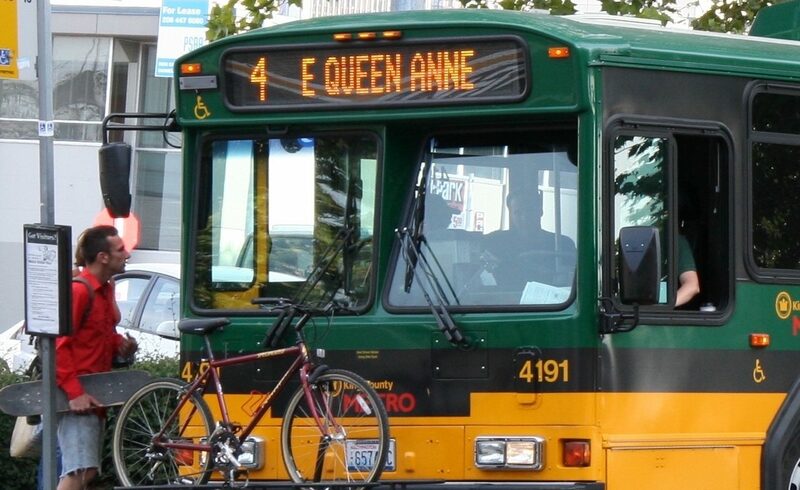 Choose a transit route that covers a range of neighborhoods to incorporate ethnic and economic diversity. This is most easily done with the transit maps and Google maps open on your desktop. In Seattle this turned out to be one bus that started near our campus and connected to another that ran down into an area that is filled with new immigrants. Drive the route(s) and make sure there are enough things of interest. If the neighborhood is too residential, it is a bit tough. Businesses, places of worship, community centers, libraries and parks will yield more fascinating stories. Have Google Maps create a route using the transit option. This way Google will draw the line down the route for you. Divide the route into enough sections to make groups of five students. For instance, I had a Convergence Journalism class of twenty-five students, so the density of two bus routes that covered about 10 miles worked quite well. Print each route and define your story-finding boundaries. The limits for my class were one block on either side of the bus route, but you might want to expand or shrink this according to the density and general story potential. Make enough color copies of the maps for each group of five students to have a set. Give each group a set of maps. Let them loose to do research for about an hour. They can use anything at their disposal in the classroom. As expected, my students went to Google Maps and eventually used Google Earth and street view. Many went to Yelp, TripAdvisor, and other crowdsourcing apps. By the end of the hour, the groups ranked their choice of route. While I was working through their choices and figuring out which group would get which route, I had them work on an exercise called Starting Blocks to create ideas for stories in any city. I broke a tie with a simple draw of numbers. Reveal their routes and give the groups time to talk about schedules for the future weeks. All students received this handout to guide them through the project. You’re welcome to copy it to adapt in your own class. Every week starting [date] please post your work onto your site (with proper tagging/categorizing). I realize that some of these will include many parts produced by your group, but I just want your part on your site. Later you may put your group’s whole story there, but for now just your work. Copy the link to that story post and paste it into the comments for the weekly deadline post on our course site. When you do this, please label it with your route number. I should see 25 posts/links every week. Sometime between Sunday at midnight and class time Tuesday, please look at the work of someone outside of your group and make some constructive comments on their site. If you see someone has already commented, please find one that needs comment. In your critique, please note the requirements of each story type, but I’m most interested in what you think could improve the story. Remember, tell the producer what you like and then something that would really make it outstanding. Please make sure there is a good lead — an attention-getting idea. It doesn’t need to be a traditional news story lead, but needs to lead the reader to explore. Be sure you write a headline for this story, as well. These should be 300-500 words, but write the amount the story takes. 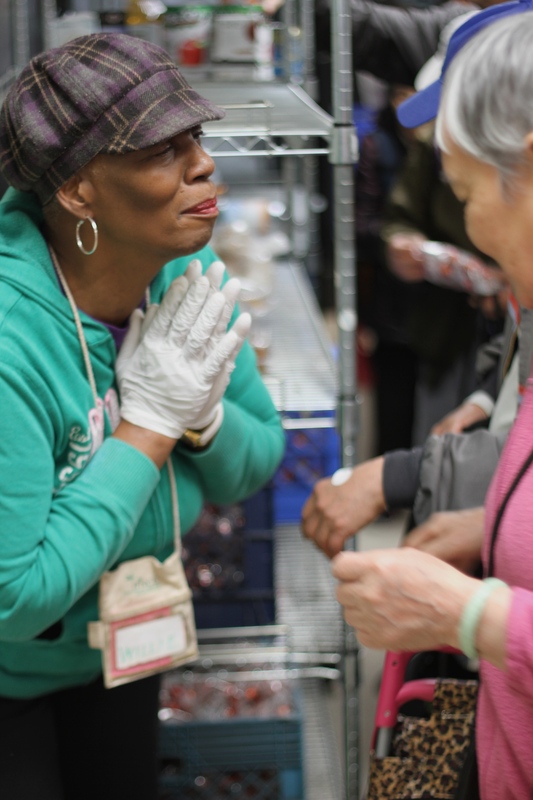 A volunteer at the Rainier Valley Food Bank greets a regular. This is a set of 10-20 photos with excellent composition, lighting and shot variety. As you noticed when we went through the boot camp, they don’t all have to have people, but the majority should be people-centered. Remember to get close-ups, wide-shots, faces, details. A solid audio story OR set of interviews that explains something to the reader/listener. If it is the latter, I would like to see thumbnail portraits of those featured (like the sketcher piece from the Seattle Times — though not that complex). A full story should run between 1:30-3:00 and have good “natural sound” – audio that puts the listener into that place (sound of milk steamer or saw or laughter). If it is a set of audio clips with individual interviews — please don’t let any of the clips run longer than 1:00 well edited. No music unless it exists at the scene. Use all your knowledge from the bootcamp and feedback and watching good and bad examples. The video should run between 1:30-3:00. It must contain at least one sequenced action and again, must have all of the good visual elements: wide, medium, tight, close-ups, cut-aways, unusual shots. Remember the BBC 5-shot idea — that helps. It must also be shot horizontally – no vertical video. Audio must be clean, and it must be easy to hear the subjects. No music unless it exists at the scene. Please be sure you credit the source of your information — census, city of Seattle, one of your subjects in the story. This may be a timeline, an enhanced map (not just a screen shot of Google maps), a poll, a quiz. But it must tie in with a story somehow. We could have done the whole site Every Stop a Story on WordPress, but I had a student who was a math and computer science major so he built the site using Muse. We got the pages worked out with some group thinking using wireframes and a workday in class. All students were responsible for uploading material to a shared drive and identifying what content they wanted used and where. On the day of our scheduled final exam, I had a group of professionals come in to give feedback and listen to what the students had learned in the process. In hindsight I should have sent our guests the link to the site about a week prior to our time together since they needed more time to review. I had six people from our market — two from newspaper, one from a news startup, two from television, and one from our University Communications office. Each group had to show off their pages and talk about the good/bad/hard parts of producing all of this material. Peg Achterman (@achterman) is an Assistant Professor of Communication and Journalism at Seattle Pacific University.